We spent the weekend exploring our favourite haunts (in every sense of the word) around the South Downs in Sussex. On Saturday, my husband took me to the Litlington Crystal Store to let me choose a present for our wedding anniversary later this week. Yesterday, I took my hubby to our favourite bookshop outside London - Much Ado Books, in Alfriston, Sussex - so he could choose a present for me to buy him. We ended up buying a pile of tomes – perhaps not the wisest of shopping trips seeing as we were in the middle of a five-mile ghost walk at the time. We’d chosen to do another walk from GhostHunter Walks in Sussex, following on from the lovely tour of the haunted villages around Ardingly Reservoir over the bank holiday. This one started from the foot of the mysterious Long Man of Wilmington, just down the road from Litlington. There are many theories as to the origins of the Long Man. 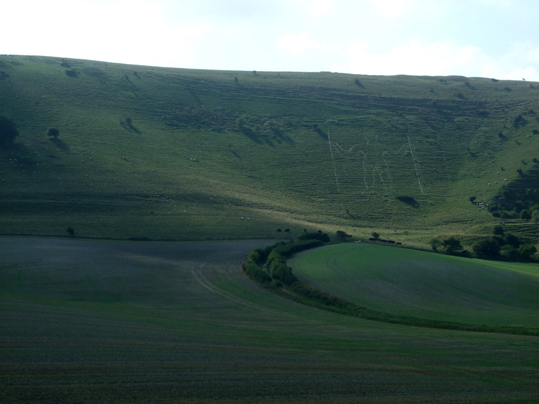 According to Rupert Matthews, author of GhostHunter Walks in Sussex, one explanation is that the chalk outline is a sort of ancient crime scene marker, having been drawn around the dead body of a local giant who was murdered by another giant from nearby back in the day when such giants were said to live. Another tale is that it is the site of a grave of a Roman officer, who was buried in a gold coffin. There are no records of it being located yet, but I’m not sure Sussex Past, which manages the site, would take too kindly to a witch dowsing for treasure there. The walk descends across fields and riverside meadows to the lovely village of Alfriston, which has several ghosts. 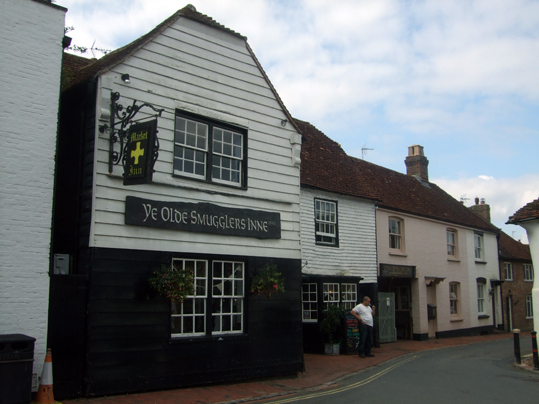 The Smugglers Inn – associated with the infamous Collins Gang of smugglers in bygone times – is haunted by a lady in grey. Deans Place Hotel has a resident ghostly lady in blue, while a spectral white dog is sometimes seen along aptly named White Way. He is supposedly searching for his master, after the two of them were brutally killed by thugs in the 18th century. The man’s skeleton was discovered many years later and buried in the local churchyard, but his faithful hound’s bones were never found. Much Ado Books is right next to the Smugglers Inn and if you are in the area and like browsing bookshops, it is really worth visiting. 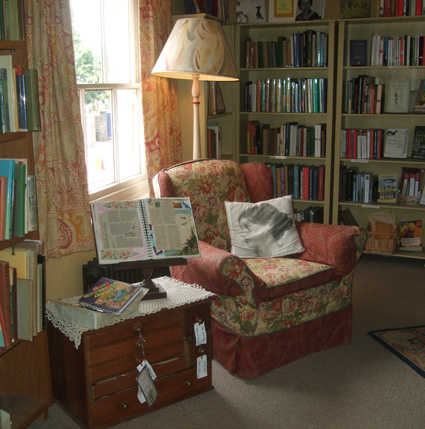 It is on two floors and sells both new and vintage books as well as maps and greeting cards, and plenty of things to read about the local area. The second floor has a cosy reading corner, which you can see in the photo, and the owners of the shop are really friendly and helpful. Browsing is encouraged too.